If you only need just part of your total quantity in a rush, we can save you money by only shipping part of your order faster. Our goal is to show you how to spend a $1 and make $10 - and if you focus on your clients needs and communicate enticing offers versus focusing on your company, you will see a much higher response. 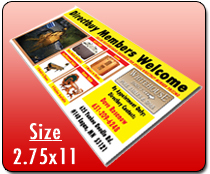 The owner of WorldsCheapestPrinting.com has been engaged in Marketing his entire life and is happy to share all the good ideas he has had the opportunity of seeing and learning. To schedule a FREE Marketing call, please click here to submit a brief Marketing Questionairre and to schedule a return call.